If you ever wanted to gaze down on our planet from space, try Cities of Earth 3D Free Screensaver. The screensaver features our planet revolving at the speed it actually does.Â It is particularly curious that it lets you see the Earth just as it looks like now, the moment you are running the program. You’ll also be able to see the world’s largest cities marked with bright spots. There is also a zoom in/ out function, which lets you see the planet much closer. A perpetual calendar with the world clock function. Want a smarter alternative to conventional calendars? Try Timestimator. It spares you the effort of calculating anything by hand when you need to know duration between two dates or vice versa, calculate a due date for any event. Moreover, the software instantly tells you time difference between your city and any remote location and current time in any part of the world. Read the full review. If you need to measure anything on your desktop, Perfect Screen Ruler provides a convenient way to do so. The program simply makes a screenshot of what is visible on your screen, lets you zoom in on it and displays vertical and horizontal distances between any indicated points. 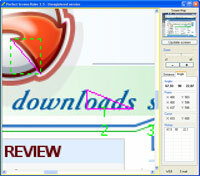 The software also gives you the ability to measure angles. Read the full review.